Alexander Albon will complete the Toro Rosso driver line-up for 2019, the team have confirmed. The British-born Thai driver, who finished third in feeder series Formula 2 this year, will partner Daniil Kvyat next season. Albon replaces Brendon Hartley, who has been axed after a difficult debut F1 campaign. The announcement marks a return to the Red Bull family for Albon - the 22-year-old had been on the team's junior programme before being dropped in 2012. Toro Rosso chief Franz Tost said: "The way he is able to overtake many of his rivals in the races shows that he is ready and matured to race in Formula 1. "Scuderia Toro Rosso is very much looking forward to 2019, as with Daniil and Alex we have two young, very strong and competitive drivers." Rachel Brookes reviews the dramatic F2 season. 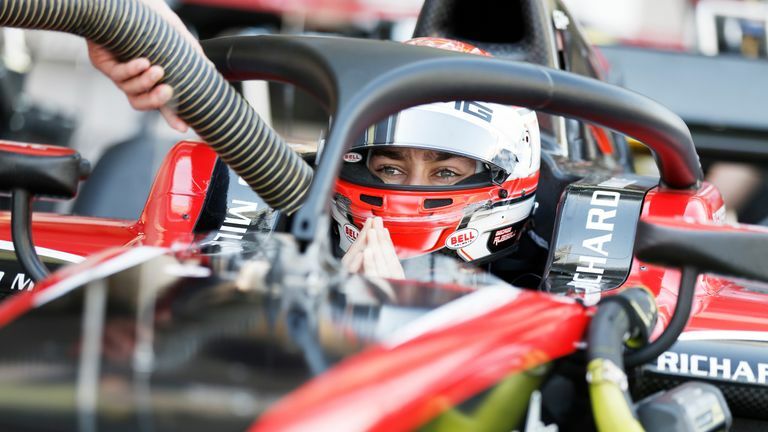 Albon had been set to compete in Formula E next year after signing a deal with Nissan, but the London-born driver will now become the first driver to represent Thailand in F1 in over 60 years. "I was dropped by Red Bull in 2012, so from then I knew my road to Formula 1 was going to be a lot harder," said Albon. "I have to say a big thank you to Red Bull and Dr Marko for believing in me and giving me a second chance. "I've always been motorsport mad and since I first got in a car it's been my dream to be in Formula 1. To be given this opportunity is just incredible." There is now only one seat remaining on the F1 2019 grid, though Force India are expected to confirm Lance Stroll as early as this week. Albon has enjoyed an impressive junior career, finishing second behind Charles Leclerc in GP3 in 2016, while he was George Russell's main rival for the F2 title this year. A crash in the penultimate race of the season, however, ended his hopes and dropped him down to third. He joins Kvyat at the Red Bull junior team in 2019, with the Russian also brought back having previously been axed from the programme. Toro Rosso, who finished ninth in the championship this year, will be entering their second season with Honda engines.